The two-hour "Our Way" concert video celebrating Frank Sinatra will be available anytime on demand at YouTube starting July 15. The show, which was recorded in Washington, D.C., includes performances of "My Way", "New York, New York", and other classics by vocalist Peter Cannella with the Brian Choper Jazz Project. "Sinatra fans are in for an unforgettable experience," said drummer Brian Choper. "We plan to mix it up by throwing in a Michael Buble’ version of a Sinatra tune, and there will be a few surprises." BigShot Records will celebrate pop and jazz legend Frank Sinatra by streaming a full-length video of a tribute concert featuring the Brian Choper Jazz Project, a band led by veteran drummer Brian Choper. The two-hour "Our Way" concert video will be available anytime on demand at YouTube starting July 15. The show, which was recorded in Washington, D.C., includes performances of "My Way", "New York, New York", and other Sinatra classics by vocalist Peter Cannella. The Sinatra prodigy joined the band last year after packing houses in venues along the East Coast. Access to the on-demand "Our Way" concert video is free. Individuals can watch the show at http://bit.ly/29fa1Vk . Sinatra and Brian Choper Jazz Project fans filled the Mishkan Torah Synagogue to hear the Sinatra classics on June 26. Part of the proceeds from ticket sales supported Sinatra for Seniors, a non-profit organization that brings music to senior citizens to help improve mental health. Individuals can make donations while watching the video at YouTube. To learn more, visit https://www.gofundme.com/29v7wheu . "We are delighted to partner with the Mishkan Torah Synagogue for this highly worthwhile effort to honor Frank Sinatra, while also supporting better mental health for our seniors," said Choper, founder of BigShot Records and its parent company, Washington Entertainment Connection. "This concert has been months in the making. Individuals will be able to download the entire show from anywhere in the world." Ol' Blue Eyes was born in Hoboken, New Jersey, on Dec. 12, 1915, going on to become one of the most popular and influential musical artists in the 19th Century. The Brian Choper Jazz Project used the concert as the kickoff for a national concert tour. Cannella's supporting cast includes legends Brian Choper on drums, Harry Appelman on keyboards, Ephraim Wolfolk on bass, Ben Poethke on trombone, and Ron Pruitt and Ron Chatterjee on alto and baritone saxophone. "It's true that Frank Sinatra never worked with a combo or small band, so this concept is brand new," Choper noted. "We have intentionally orchestrated this to produce a great sound with fewer musicians. Most of the people we've introduced this concept to have been impressed or wowed by the rich, full sound of this music coming from fewer players. We also plan to stage shows with 17-piece orchestras like Sinatra used." Cannella's traditional pop, swing and jazz vocals have been described as “jaw-dropping and memorable.” Before signing exclusively for Bigshot Records, the vocalist sang both classics and originals at restaurants, nightclubs and casinos from New York to Washington. WEC spent several months trying to find the right musicians to back him before eventually pairing him with the Brian Choper Jazz Project. The tenor’s favorite classics include Bobby Darin’s version of “Mack the Knife”, and of course the Sinatra anthems. "Sinatra fans are in for an unforgettable experience," Choper added. "We plan to mix it up by throwing in a Michael Buble’ version of a Sinatra tune, and there will be a few surprises." All six backup musicians are popular acts on their own. Choper is the founder and drummer of the renowned New Klezmer Quintet and the Nexus Rock Band. Appelman, who teaches at Montgomery College, has appeared around the world with renowned bands. Wolfolk serves on the board of the Washington, D.C., Federation of Musicians. Poethke has performed with the Nostalgia Big Band and was a member of the Bluecoats Drum and Bugle Corps from 2011-2013. Pruitt currently works as a music instructor in South Brunswick, New Jersey, where he conducts orchestras and teaches. Chatterjee works with different organizations in the New Jersey area to mentor and inspire young artists in jazz and classical music. The "Our Way" Sinatra tribute concert will be edited for future on-demand streaming at http://www.BigshotRecordsLive.com. Individuals can download a record label app for their smart phones by visiting https://itunes.apple.com/us/app/bigshot-records/id1100226714?ls=1&mt=8 (iPhone) or https://play.google.com/store/apps/details?id=com.conduit.app_54510a99ac6f47e5805a4ac5b3c8ea80.app (Android). Follow Bigshot Records on Facebook at http://www.Facebook.com/BigshotRecords and Twitter at http://www.Twitter.com/BigshotRecords. 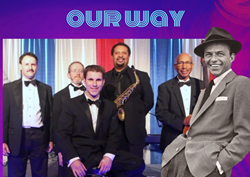 For information about booking an "Our Way" concert celebrating Sinatra, contact Bigshot Records at (301) 441-8899 or tbarnes(at)entertainmentdc(dot)com .